The Topeka North Outreach (TNO) Youth Ministry provides vital services for children in our community. We reach out by meeting basic needs, ie food, hygiene, clothing, & school supplies. We then work to build a relationship with the child to teach them of their true worth and value by mentoring, tutoring and discipling them. OPERATION BACKPACK: Works to alleviate childhood hunger by providing Weekend Food Sacks filled with nutritious, kid-friendly food items that are easy for youth to prepare. 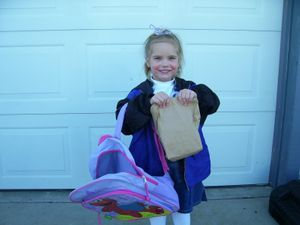 Sacks are sent home with school children on Fridays, and the day before a Holiday to ensure they have food EVERY day of the week. Our summer program distributes food sacks at several pick-up sites. VBS CLUB: Works directly with children to provide after school and summertime activities. Shares bible stories, crafts, music, games, service projects, field trips, homework help, snacks and an evening meal each Friday. Teaches social skills, manners & etiquette. HYGIENE MINISTRY: Distributes hygiene kits to area children and schools in an effort to motivate personal body care. SCHOOL SUPPLY GIVEAWAY: Book bags and school supplies are given away at the start of the new school year. SCHOLARSHIP: Limited assistance for school enrollment, activity fees, and clothing needs. We serve children from Low Income, Working Parent, Single Parent, Foster / Adoptive Parent, Grandparent Parent, and / or Disabled Parent Homes.